Shares are Costco Wholesale (COST - Get Report) jumped on Friday, rallying more than 5% and closing at $227.82 after the company's better-than-expected fiscal second-quarter earnings results. Despite a positive earnings reaction to Dollar Tree (DLTR - Get Report) , Target (TGT - Get Report) and other retailers, investors weren't sure how to size up Costco ahead of earnings. But with Friday's move, it paves the way for more potential upside. Let's see the key levels on Costco now. One-year daily chart of Costco stock. With Friday's gap-and-go, Costco stock is showing solid relative strength vs. an overall market that is lower on the day. The S&P 500 and other indices are struggling after a much lower-than-expected jobs report was released before the open. To see Costco outperforming in a tape like this is encouraging, to say the least. Sporting a 52-week high just below $245 and bulls will surely be aiming for that mark as they look to bid this stock higher. 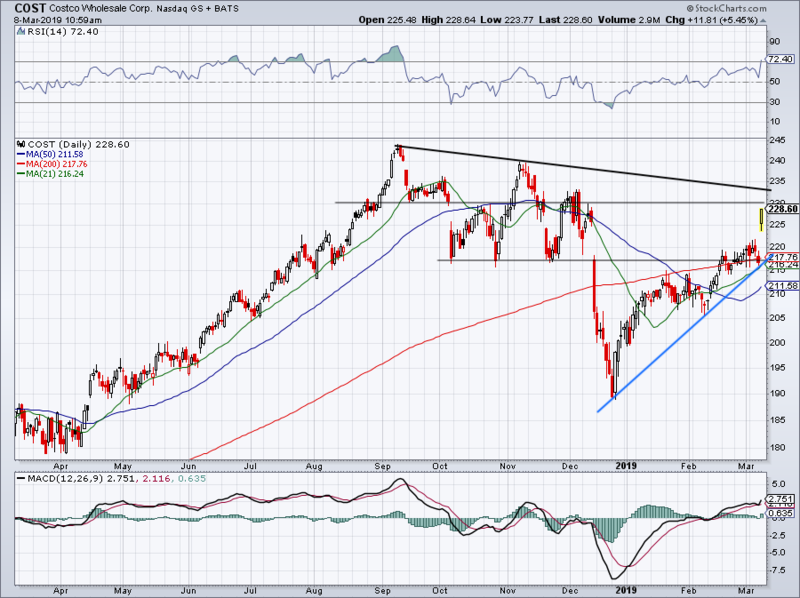 However, I want to see if the $230 to $232.50 level gives Costco stock any trouble. The former has been a notable level in the past, but far from the end-all, be-all mark for Costco. Coupled with downtrend resistance just overhead, though, and this will be an important level to observe. Over it and COST stock can press $240+. The downside here is important, too. While it would be incredibly discouraging to see COST stock give up all of Friday's gains and fall back below $220, there should be a ton of support in that region. With the 200-day at $217.75, the 100-day at $217.55 and 21-day moving average at $216.25 in the area, this should prop up a potential Costco stock pullback. Additionally, the 61.8% Fibonacci retracement for the 52-week range is at ~$219 and uptrend support comes into play just below $220. So below $217 and Costco stock would officially be in trouble. But a pullback into that region would not be a bad risk/reward for longs, should it pullback that far in the first place. Watch this $232.50 area and how Costco stock proceeds. If it coils beneath for a few sessions, it increases the odds of a breakout. Wall Street is obviously reacting favorably to the $2.01 in earnings per share the company reported, which came in 31 cents or 18% above expectations. However, revenue of $35.4 billion came up $250 million short of expectations, although it did grow 7.3% year-over-year. Margins and comparable-store sales were also impressive, as RealMoney's Stephen Guilfoyle noted, "Perhaps even more impressive was the 6.7% increase in same-store sales that apparently had not been cannibalized by a 25.5% increase in e-commerce. That, my friends, is called execution."